At Railyard Brewing, we make our beer with passion and a mission to craft only the best-tasting brew with the finest ingredients. Why the name Railyard? We knew that we wanted to create great craft beer and combine it with an artistic vibe. Inspiration can come from the most unusual places and ours was when we were stopped at a railway crossing. Freight cars full of malt passed by with phenomenal murals of graffiti art. It was this combination that inspired us to create Railyard Brewing. Fusing the finest Alberta Malt & classic European hops the Railyard Lager brings down the rail-crossing gates when it comes to quenching your thirst. Graham cracker sweetness, balanced with a delicate hop herbaceous finish, look no further than this being the last stop of your day. A classic Westcoast stop on the Railyard tracks with the unmistakeable grapefruit and orange zest hop from both boil and dry hop additions, balanced with a caramel malt backbone and dried out perfectly to make sure you are getting on board for until the last stop. The leading engine at Railyard & the only nitrogen packaged Stout coming out of Alberta. Rolling into the yard with bold coffee roast on the palate, underlying black molasses aromatics, balanced with light caramel sweetness & a nutty lingering. Rich, creamy & earthy, this flavour train doesn’t stop for anyone. Swing into the taproom to check out our new and limited releases while they're available! Find us on FACEBOOK, TWITTER, INSTAGRAM and UNTAPPD! *All plates come with crackers, pickles and/or olives. Charcuterie plates include grainy mustard. Cheese plates include compote. Please note: This is NOT a peanut free facility. Planning an event? We have a unique event venue perfect for: Birthdays, Holiday Parties, Bachelor(ette) Parties, Weddings, Corporate Meetings, Live Music, Fundraisers and more! Let us know the date of your event. Thanks! We will get back to you shortly to schedule your event. Check our Events Page to confirm taproom availability, from time to time, the taproom space is rented for a private event. We are offering a limited number of lifetime memberships to those who share our passion and ideals. For supporting us in our next building phase you will receive some amazing benefits only offered to Founders Club members. Want a terrific deal on beer for a year? This membership is a pretty awesome deal! The Boxcar Membership fee is $300. The memberships are valid from time of purchase for one year. For more details, look go to memberships on our Shop page. 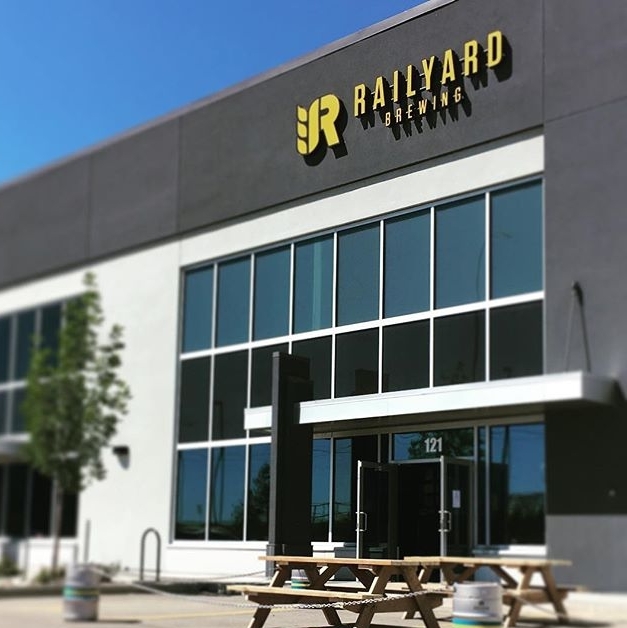 Railyard Brewing and taproom is located near the Calgary airport and boasts one of the most unique taprooms in Calgary. Our staff is dedicated to brewing quality beer and we would delighted if you would drop-in for a tasting. Whether you're planning a private function, or want to know more about an upcoming brewery event, we'd love to hear from you! Check out our Event Calendar for upcoming events. Keep me up-to-date on news and exclusive offers. Interested in a Brewery Tour? We love what we do and would be delighted to show you how we brew quality beers. Wednesday's at 7pm, Saturday's at 12:30 to 2:30pm, Sundays at 2:30pm AND upon request, parties of 6 or more. Please indicate the number of people attending. Thank you! We will get back to you to confirm. We take pride in crafting beer, Alberta style. Our goal is to create something special. You want the best, and we want to make it for you. Check out our Railyard Beer Finder for a location near you. New locations all over Alberta (and beyond) are being added all the time. If you have a suggestion for a new vendor location, we would love to hear from you. Interested in carrying Railyard beer? Perhaps you have a suggestion for us?